Many of us lead extremely busy day-to-day lives. As a result, tasks like managing weight and getting an adequate amount of sleep each night can seem like impossible goals. So what if you could burn more fat- while getting a full night of restful sleep? 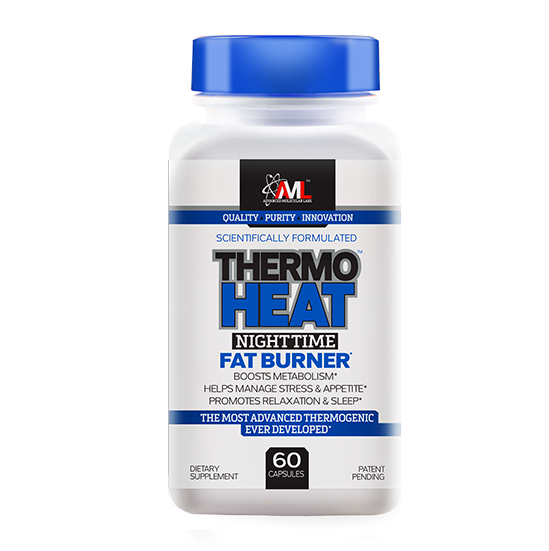 Thermo Heat® Nighttime, the new product from Advanced Molecular Labs (AML), has an exclusive blend of compounds that help the body attack fat by facilitating thermogenic fat loss. When consumed before an evening meal or at bedtime, Thermo Heat® Nighttime helps the body to maintain an elevated level of thermogenic fat burning during the evening, and at the same time, helps promote relaxation and sleep. 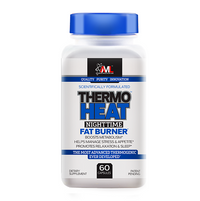 In addition, Thermo Heat Nighttime activates your body’s own appetite-suppressing hormones and neurotransmitters in order to mitigate food cravings for smoother dieting and fat loss. It’s all based on recent scientific evidence on a process known as thermogenesis, which burns body fat in humans by stimulating the activity of brown adipose tissue (BAT). TORCH FAT FATTY ACID OXIDATION AND ENHANCE. Capsaicinoids found in Thermo Heat Nighttime aid the body to thermogenically torch fat and activate the body’s TRPV receptors, resulting in enhanced fatty acid oxidation. Among the TRPV receptor activators investigated so far, the most extensively studied have been capsaicin and other capsaicin-like compounds known as capsaicinoids that are abundantly found in Thermo Heat® Nighttime. THERMO HEAT NIGHTTIME PROMOTES RELAXATION AND SLEEP. Melatonin, which is found abundantly in Thermo Heat® Nighttime, is a hormone secreted by the pineal gland in the brain that regulates the sleep/wake cycle helping you fall asleep. Melatonin is also involved in energy metabolism and bodyweight control. Many studies show that melatonin helps the body to reduce bodyweight and abdominal fat. Melatonin also stimulates the activity of brown adipose tissue, which enhances energy expenditure and fat burning. COMPOUNDS IN THERMO HEAT NIGHTTIME HELP MANAGE STRESS AND ENHANCE MOOD. One of those compounds being L-theanine, an amino acid naturally found in tea that is able to cross the blood-brain barrier and influence activity of the central nervous system. Studies have shown the ability of L-theanine to affect the central nervous system results in increased relaxation, improved feelings of wellness and improved sleep quality. L-theanine is more effective when synergistically combined with gamma-aminobutyric acid (GABA), 5-hydroxytryptophan (5-HTP) and melatonin. THERMO HEAT NIGHTTIME HELPS THE BODY INCREASE SEROTONIN PRODUCTION. Thermo Heat® Nighttime contains 5-hydroxytryptophan (5-HTP), which is an amino acid that can also pass the blood-brain barrier where it is converted into the neurotransmitter serotonin. The increased production of serotonin is associated with feelings of tiredness and fatigue, as serotonin regulates the sleep-wake cycle. In addition, serotonin curbs cravings and reduces appetite. As a result, 5-HTP promotes sleepiness while curbing appetite by increasing the body’s serotonin production. PROMOTES RELAXATION AND GROWTH HORMONE. Gamma-aminobutyric acid (GABA) is one of the chief inhibitory neurotransmitters in humans. The inhibitory effect of GABA on the body results in better-managed stress, making it an integral part of the relaxing influence of Thermo Heat Nighttime. In addition, GABA has also been shown to have peripheral activity in various tissues and organs throughout the body, helping to regulate cardiovascular functions, renal functions and regulation of the pituitary gland. Interestingly, GABA’s aid in regulating the pituitary triggers the release of growth hormone, which promotes lipolysis and fat burning. UNIQUE SPICE BLEND THAT HELPS THE BODY SUBDUE APPETITE AND INCINERATE FAT. 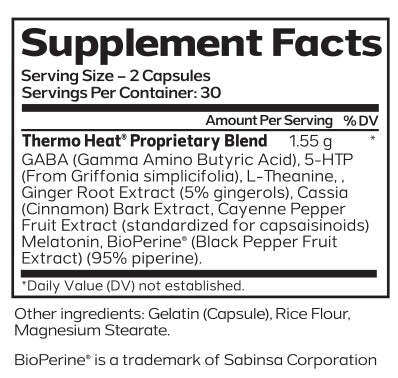 Thermo Heat® Nighttime contains a unique blend of spices that helps the body suppress appetite and enhance thermogenesis. 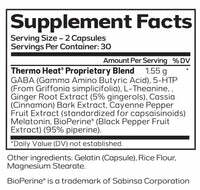 The capsaicinoids found in Thermo Heat® Nighttime help stimulate and preserve fat loss. Recent evidence shows their comprehensive ability to increase the body’s fat oxidation while also reducing appetite.